The National Security Agency routinely shares raw intelligence data withIsrael without first sifting it to remove information about US citizens, a top-secret document provided to the Guardian by whistleblower Edward Snowden reveals. The disclosure that the NSA agreed to provide raw intelligence data to a foreign country contrasts with assurances from the Obama administrationthat there are rigorous safeguards to protect the privacy of US citizens caught in the dragnet. The intelligence community calls this process “minimization”, but the memorandum makes clear that the information shared with the Israelis would be in its pre-minimized state. “Any US person information that is acquired as a result of NSA’ssurveillance activities is handled under procedures that are designed to protect privacy rights,” the spokesperson said. The memorandum of understanding, which the Guardian is publishing in full, allows Israel to retain “any files containing the identities of US persons” for up to a year. 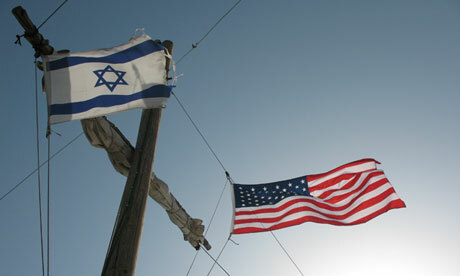 The agreement requests only that the Israelis should consult the NSA’s special liaison adviser when such data is found. Notably, a much stricter rule was set for US government communications found in the raw intelligence. The Israelis were required to “destroy upon recognition” any communication “that is either to or from an official of the US government”. Such communications included those of “officials of the executive branch (including the White House, cabinet departments, and independent agencies), the US House of Representatives and Senate (member and staff) and the US federal court system (including, but not limited to, the supreme court)”. The document mentions only one check carried out by the NSA on the raw intelligence, saying the agency will “regularly review a sample of files transferred to ISNU to validate the absence of US persons’ identities”. It also requests that the Israelis limit access only to personnel with a “strict need to know”. Israeli intelligence is allowed “to disseminate foreign intelligence information concerning US persons derived from raw Sigint by NSA” on condition that it does so “in a manner that does not identify the US person”. The agreement also allows Israel to release US person identities to “outside parties, including all INSU customers” with the NSA’s written permission. Although Israel is one of America’s closest allies, it is not one of the inner core of countries involved in surveillance sharing with the US – Britain, Australia, Canada and New Zealand. This group is collectively known as Five Eyes. 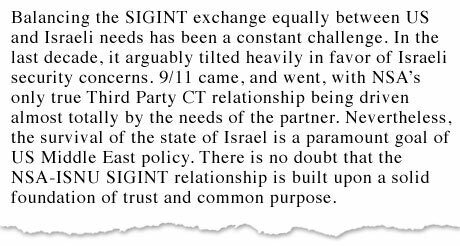 The memorandum of understanding also contains hints that there had been tensions in the intelligence-sharing relationship with Israel. At a meeting in March 2009 between the two agencies, according to the document, it was agreed that the sharing of raw data required a new framework and further training for Israeli personnel to protect US personinformation. It is not clear whether or not this was because there had been problems up to that point in the handling of intelligence that was found to contain Americans’ data. The Guardian asked the Obama administration how many times US data had been found in the raw intelligence, either by the Israelis or when theNSA reviewed a sample of the files, but officials declined to provide this information. Nor would they disclose how many other countries the NSA shared raw data with, or whether the Fisa court, which is meant to oversee NSA surveillance programs and the procedures to handle US information, had signed off the agreement with Israel.